Bog mats (rarely in fens or cedar swamps except on sphagnum hummocks), persisting under spruce and tamarack. Inattentive collectors often mix this species with V. macrocarpon and even with Gaultheria hispidula. The acute aspect of the leaf tips is often enhanced by more revolute leaf margins toward the apex, resulting also in a somewhat ovate blade. 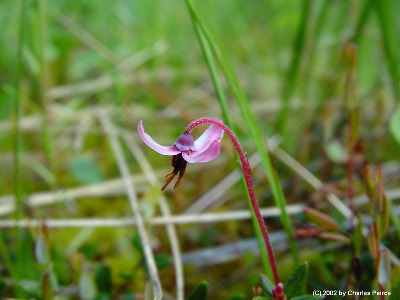 In both cranberries, the stamens are 8, each anther terminating in 2 long slender tubules; the cone-like mass of stamens and strongly reflexed petals combine to give the flower the appearance of a miniature shooting-star (Primula meadia). See also comments under V. macrocarpon. MICHIGAN FLORA ONLINE. A. A. Reznicek, E. G. Voss, & B. S. Walters. February 2011. University of Michigan. Web. 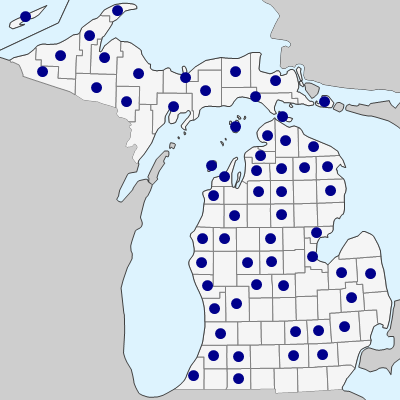 April 21, 2019. https://michiganflora.net/species.aspx?id=1238.